(K) — KINDNESS: (2 minutes) Feel loving kindness and compassion. Feel as if you want to embrace the whole world and all creatures therein. (8:10-8:25pm) Now stop feeling and radiating JVPLK, just go to the center of your heart-sun and stay there for 15 minutes. What this technique does is that it uses our mind to focus and bring us closer to the more harmonious, creative, and nourishing energy that creates and sustains us; not to the gross vibrations which cause suffering and disease. All the pains and sufferings, the absence of abundance, the presence of bad turn of events, the recurrence of undesirable circumstances are brought about by one’s uncontrolled thought processes that are negative. 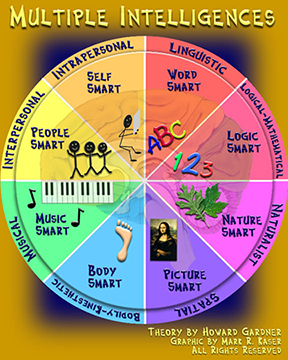 Gardner's multiple intelligences theory challenged traditional beliefs in the fields of education and cognitive science. According to Howard Gardner, intelligence is:The ability to create an effective product or offer a service that is valued in a culture;A set of skills that make it possible for a person to solve problems in life;The potential for finding or creating solutions for problems, which involves gathering new knowledge.